Yes, I know we all signed on to be a boy band together. I read the contract just like the rest of you guys. I’m totally happy touring with you, and our manager has indeed fulfilled his promises to make us rich and famous beyond belief. What makes me angry is the fact that I’m doing all the work while the rest of you jokers sit around texting your supermodel girlfriends. How many more nights will I have to spend in the studio, alone, laying down the backup vocals you guys were supposed to provide? How many more lonely mornings will I have to polish the lyrics over cold coffee and stale toast? Love songs don’t write themselves, you know. It’s gotten to the point where some of our producers think I’m a solo act. They’ve never even seen you guys. Can’t you be bothered to hire a limo and spend a few hours in the studio? I was only supposed to sing lead on 13 of the 15 tracks per album, but I might as well do the last two since you guys are never around. And don’t even get me started on our music videos. The last one I had to storyboard, choreograph, direct, and edit. All you guys did was mouth the lyrics and demand more Snickers at the snack table. This boy band was the childhood dream for all of us. When we stood in the 7-11 parking lot drinking Red Bulls, this is what we talked about. Now we’re living the dream and you guys are acting like your work is done. Well, I’ve got a news flash for you: getting there is only the beginning of the work. A number 1 hit doesn’t just happen. It takes planning, a strong work ethic, and a spark of genius. Do you think Taylor Swift complains that they just added twelve cities to her world tour? No. She’s going to give the citizens of Karlstad the night of their lives. I’m done trying to coax you. I’ve got to put the finishing touches on this album and design the cover art. I tell you what, though: I’m not letting any of you put your thanks in the liner notes. I enjoy sketching. There’s none of the pressure of producing a finished, polished drawing. I don’t know if what I’m drawing will be a disaster or something special. When it turns out well, I’m pleasantly surprised. I’ve sketched a lot in my life, but I never knew exactly how much. 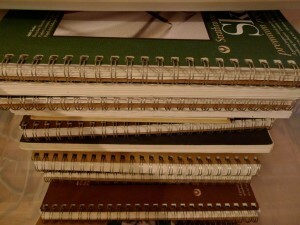 When I was back home I counted all the sketchbooks I have there, then counted all the sketchbooks I have with me here. The earliest books are from middle school (maybe a few pages from elementary school). I slowed down quite a bit in college – I was doing more writing at that point, and the drawings I made were either the comic strip I was doing or for art class projects. Not a lot of sketching. 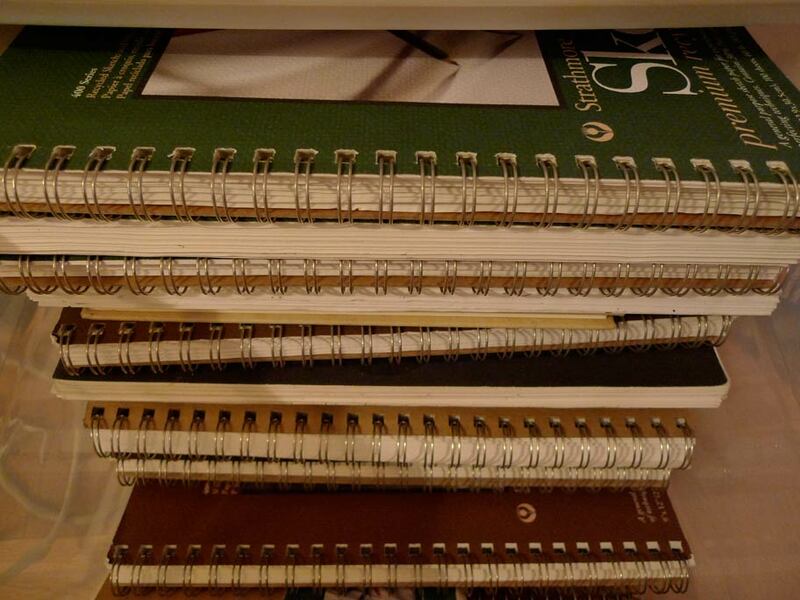 Once out of college, though, I started to burn through sketchbooks at an amazing rate. Since 2002 I’ve averaged about two books per year. Lately I’ve been using them up even faster. I’m most happy when I’m producing work, even if it is work no one else will see. I think it makes a difference in the final product. Michael Caine once said, “Be like a duck. Calm on the surface, but always paddling like the dickens underneath.” These sketchbooks are me paddling. That stunned me when I added it up. First I thought, “I really should be a better artist than I am.” But flipping through the pages I saw that I have been steadily improving. I’m glad I’m getting better, at least. Here’s to three thousand more pages! Onward!